Henry Grantland Rice (November 1, 1880 – July 13, 1954) was an early 20th-century American sportswriter known for his elegant prose. His writing was published in newspapers around the country and broadcast on the radio. Grantland Rice was born in Murfreesboro, Tennessee, the son of Bolling Hendon Rice, a cotton dealer, and his wife, Mary Beulah (Grantland) Rice. His grandfather Major H. W. Rice was a Confederate veteran of the Civil War. A young Rice at Vanderbilt. Rice attended Montgomery Bell Academy and Vanderbilt University in Nashville, where he was a member of the football team for three years, a shortstop on the baseball team, a brother in the Phi Delta Theta Fraternity, and graduated with a BA degree in 1901 in classics. On the football team, he lettered in the year of 1899 as an end and averaged two injuries a year. On the baseball team, he was captain in 1901. In 1907 Rice saw what he would call the greatest thrill he ever witnessed in his years of watching sports during the Sewanee–Vanderbilt football game: the catch by Vanderbilt center Stein Stone, on a double-pass play then thrown near the end zone by Bob Blake to set up the touchdown run by Honus Craig that beat Sewanee at the very end for the SIAA championship. Vanderbilt coach Dan McGugin in Spalding's Football Guide's summation of the season in the SIAA wrote, "The standing. First, Vanderbilt; second, Sewanee, a mighty good second;" and that Aubrey Lanier "came near winning the Vanderbilt game by his brilliant dashes after receiving punts." Rice coached the 1908 Vanderbilt baseball team. The passage added great import to the event described and elevated it to a level far beyond that of a mere football game. This passage, although famous, is far from atypical, as Rice's writing tended to be of an "inspirational" or "heroic" style, raising games to the level of ancient combat and their heroes to the status of demigods. He became even better known after his columns were nationally syndicated beginning in 1930, and became known as the "Dean of American Sports Writers". He and his writing are among the reasons that the 1920s in the United States are sometimes referred to as the "Golden Age of Sports". Rice's all-time All-America backfield was Jim Thorpe, Red Grange, Ken Strong, and Ernie Nevers. His sense of honor can be seen in his own actions. 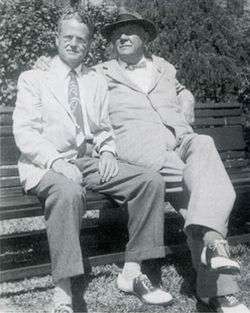 Before leaving for service in World War I, he entrusted his entire fortune, about $75,000, to a friend. On his return from the war, Rice discovered that his friend had lost all the money in bad investments, and then had committed suicide. Rice accepted the blame for putting “that much temptation” in his friend's way. 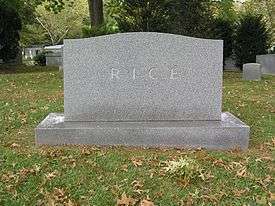 Rice then made monthly contributions to the man’s widow for the next 30 years. Part of it's percentage, and the rest is guarantee"
Rice authored a book of poetry, Songs of the Stalwart, which was published in 1917 by D. Appleton and Company of New York. Rice married Fannie Katherine Hollis on April 11, 1906; they had one child, the actress Florence Rice. 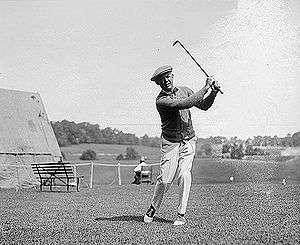 Rice died at the age 73 on July 13, 1954, following a stroke. He is interred at Woodlawn Cemetery in The Bronx, New York City. Fred Russell (left) and Grantland Rice in 1951. In 1951, in recognition of Rice's 50 years in journalism, an anonymous donor contributed $50,000 to establish the Grantland Rice Fellowship in Journalism with the New York Community Trust. In 1954, the Football Writers Association established the Grantland Rice Memorial Award, given annually to an outstanding college player selected by the group. The Grantland Rice Bowl, an annual college football bowl game held from 1964 to 1977, was named in his honor, as was the Grantland Rice Award given to the winner. Rice was posthumously awarded the 1966 J. G. Taylor Spink Award by the Baseball Writers Association of America. The award, presented the following year at the annual induction ceremony at the Baseball Hall of Fame, is given for "meritorious contributions to baseball writing". At Vanderbilt, a four-year scholarship named for Rice and former colleague and fellow Vanderbilt alumnus Fred Russell is awarded each year to an incoming first-year student who intends to pursue a career in sportswriting. Recipients of the Fred Russell–Grantland Rice Sportswriting Scholarship include author and humorist Roy Blount, Jr.; Skip Bayless of ESPN; Dave Sheinin of The Washington Post; and Tyler Kepner of The New York Times. The press box in Vanderbilt Stadium at Vanderbilt University is dedicated to Rice and named after Rice's protégé, Fred Russell. For many years, a portion of one floor of the Columbia University Graduate School of Journalism was designated the "Grantland Rice Suite". Grantland Avenue in his hometown of Murfreesboro, Tennessee was named in his honor. Rice was mentioned in an I Love Lucy episode entitled "The Camping Trip", and was portrayed by actor Lane Smith, also a native of Tennessee, in The Legend of Bagger Vance. On June 8, 2011, ESPN's Bill Simmons launched a sports and popular culture website titled Grantland, a name intended to honor Rice's legacy. It operated for a little more than four years until being shuttered by ESPN on October 30, 2015, several months after Simmons's departure. ↑ "Obituary Notes", The New York Times. October 9, 1917. Accessed on June 29, 2009. 1 2 3 "Grantland Rice Dies at the Age of 73", The New York Times, July 14, 1954. Accessed on December 27, 2012. ↑ "Major H.W. Grantland dies", The New York Times, February 18, 1926. Accessed on June 29, 2009. 1 2 Sideliner (March 1920). "Athlete, Soldier and Writer". Outing:Sport, Adventure, Travel, Fiction. 75 (6). Retrieved April 23, 2015 – via Google books. ↑ John A. Simpson. The Greatest Game Ever Played In Dixie. p. 27. ↑ "$50,000 Fund Created", The New York Times, May 3, 1951. Accessed on June 29, 2009. ↑ "Grantland Rice Award Established in Football", The New York Times, August 14, 1954. Accessed on June 29, 2009. ↑ "J. G. Taylor Spink Award Honorees", Baseball Hall of Fame. Accessed on June 30, 2009. ↑ "The Fred Russell–Grantland Rice Sportswriting Scholarship" (PDF), Vanderbilt University. Accessed on June 29, 2009. ↑ ESPN MediaZone (2011). All-Star Roster of Writers and Editors to Join New ESPN Web Site. Retrieved May 3, 2011.